View on Moscow from the Imperial Palace. Today the Kremlin Palace, the official residence of the Russian President, stands here and the view can be enjoyed by just a small group of Russian officials and high-ranking foreign guests. These old images depict streets filled with carriages, women walking along promenades and merchants selling their wares. Which of these buildings are left and which have disappeared forever? 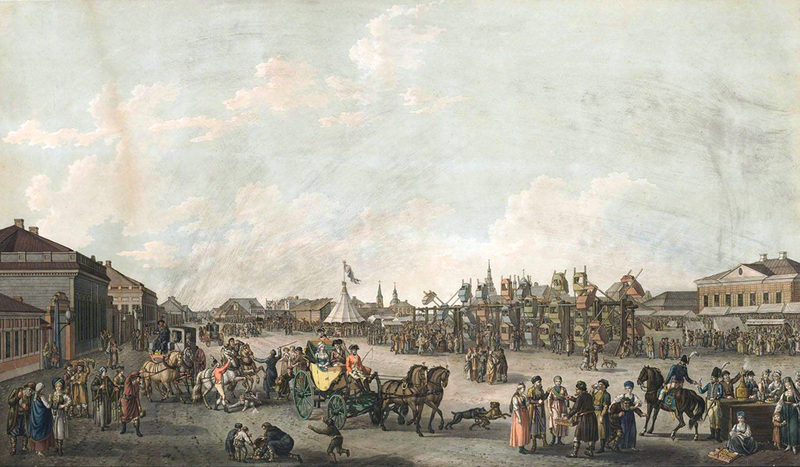 This series of watercolor images depicts Moscow at the end of 18th century during the rule of Tsar Paul I. /Pictured: the view on Mokhovaya Street and the Pashkov House. The street retained its name and the house still stands. It was built here in the Classical style for Muscovite nobleman Pyotr Pashkov. 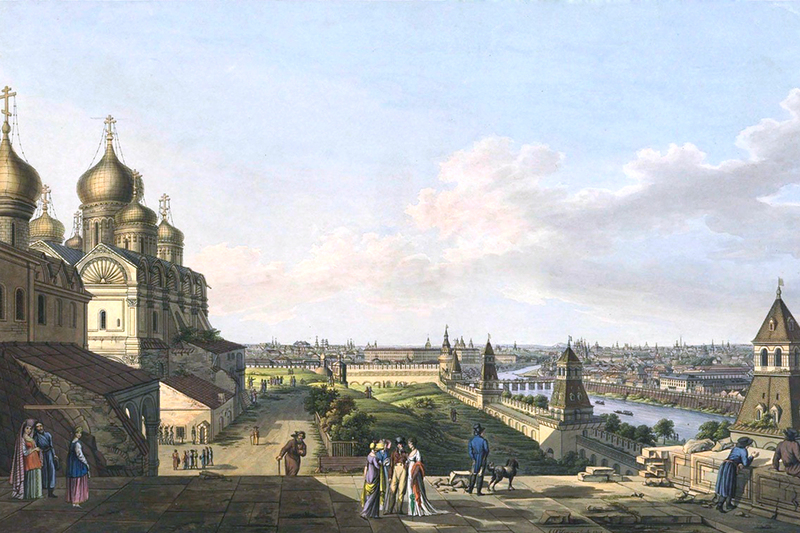 The Novodevichy Convent. While the area nearby is quite modern, the Novodevichy Convent itself is restored and open for visitors. 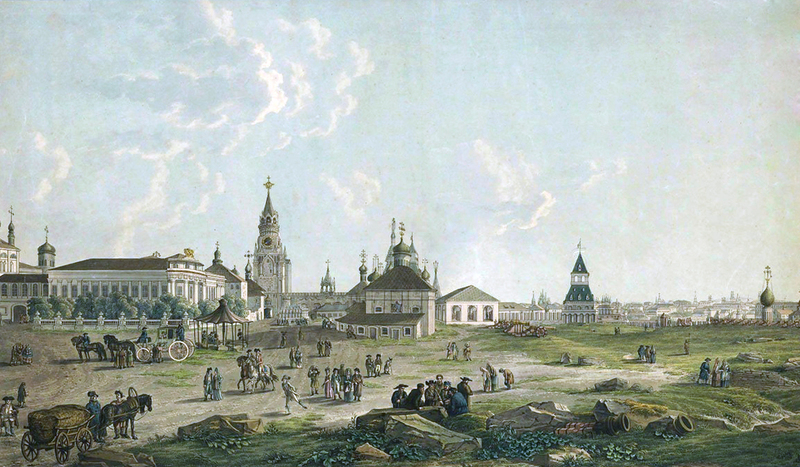 Podnovinskoe suburb surrounded the large (for that time) Novinsky Monastery, which before the fire of 1736 was situated in the area of today’s Novinsky Boulevard, not far from the center of Moscow. View on the Spassky Gates. The gates and the tower are a part of the Kremlin complex. 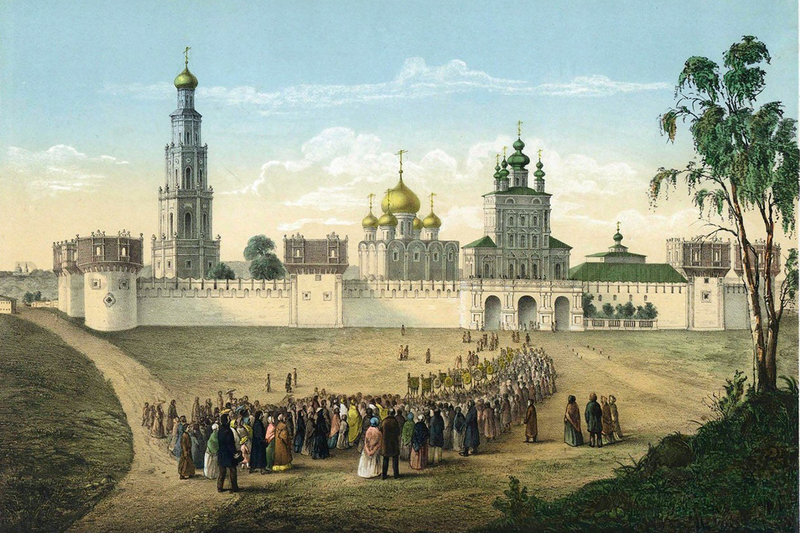 Spassky (or Saviour) Gates and tower are still exist, theay are a part of Moscow Kremlin. It is thought the Saviour Tower gates were named after the icon of the Saviour depicted on them. Troops went to war from the holy gates, and it was also here that foreign diplomats met. Petrovsky Palace. 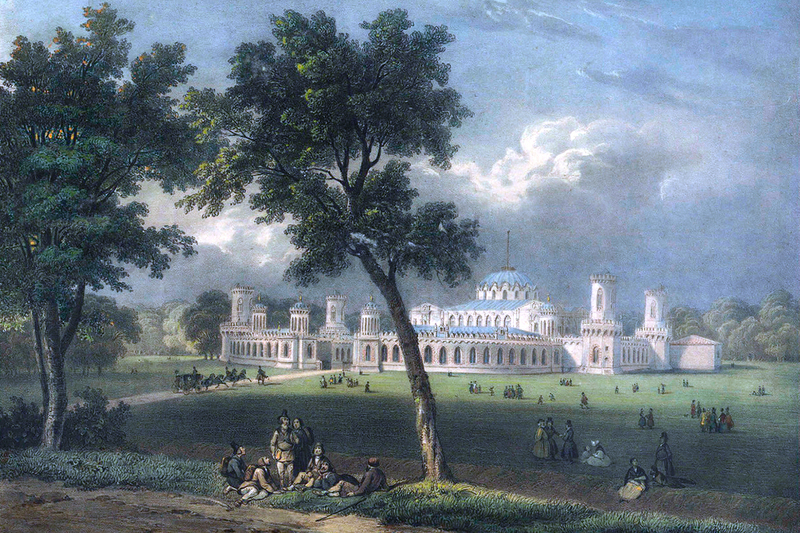 The palace is now within Moscow’s borders, but in the 18th century the area was outside city limits. 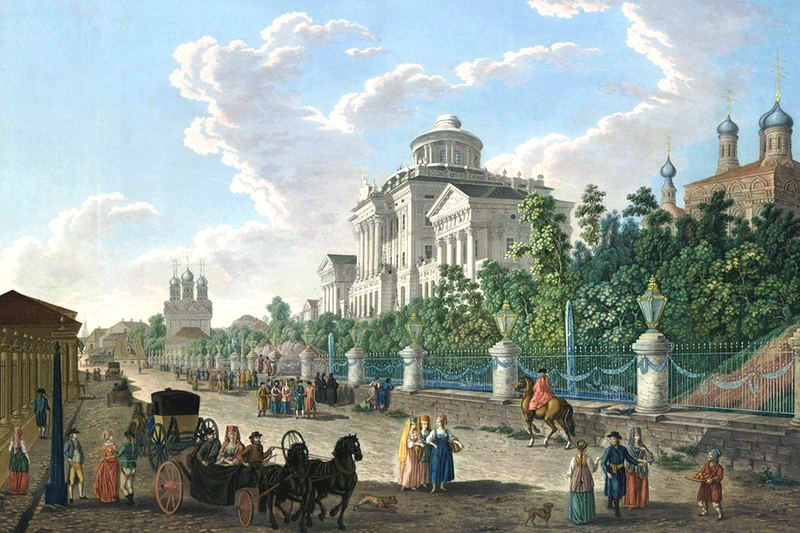 The palace was built for Russian Empress Catherine the Great in 1775-82. It was meant to be the overnight resting spot for royal journeys from St. Petersburg to Moscow. 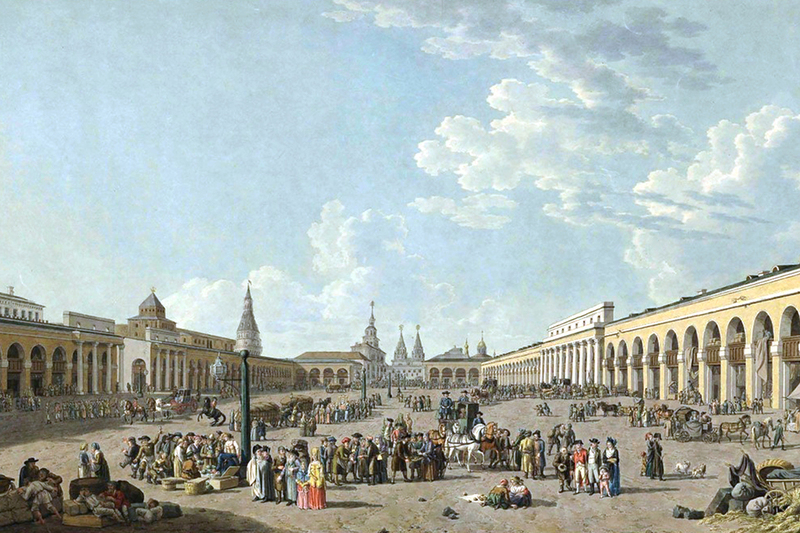 View on Staraya Ploshchad (Old Square). While the square’s name remains, it was built in the 20th century and is not really a square in the true sense of the word anymore, but a street. 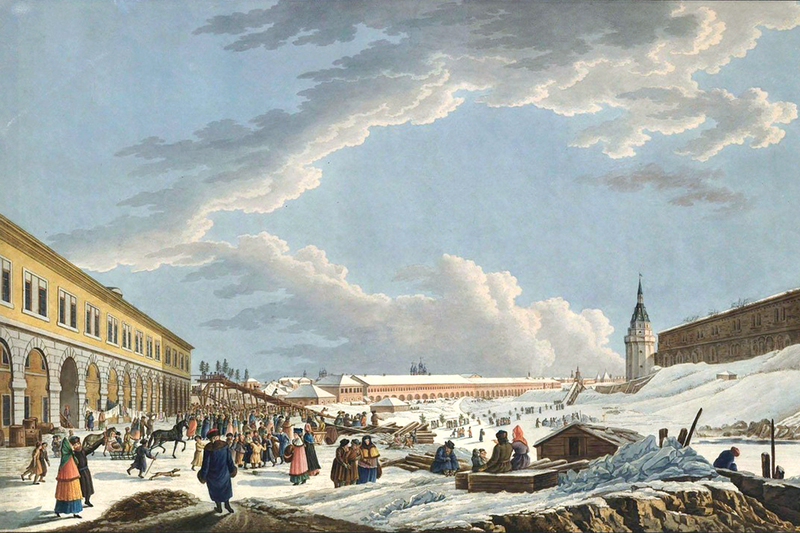 Ice slopes near the Kremlin. Red Square’s surroundings have changed a lot over time. The brick walls of the Kremlin, which was built in 1485-1495, were whitewashed in the 18th century (as the walls of every kremlin in Russia were white — Kazan, Nizhny Novgorod, Rostov Veliky, etc.) and for a long time the Kremlin retained its white exterior. It “blushed” only in 1947 ahead of the 800th anniversary of the founding of Moscow.